Emma Thompson. What a gal. She can act. She can write. She can sound intelligent in an interview. How can you not love Emma Thompson? I first became infatuated with her after Sense and Sensibility. The scene at the end of the film when Hugh Grant returns gets me choked up every time. I thought she should’ve won the Oscar for her performance, but she got the Oscar for best adapted screenplay instead. Oh well, an Oscar’s an Oscar. The always beautiful Emma Thompson is hidden beneath the warted and ugly face of Nanny McPhee. We and the children find her frightening at first, repelled by her grotesque appearence. But each of her ugly features disppear as the children learn one of five important principles. 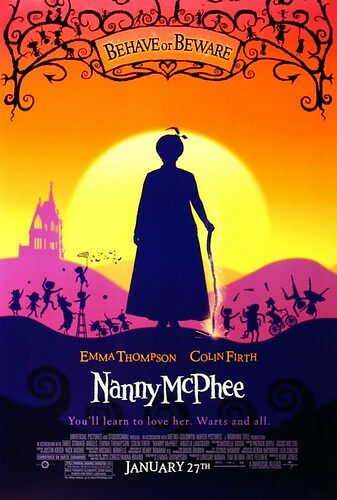 By the film’s end, Nanny McPhee is radiant in all her Emma Thompson beauty, wartless and wonderful. The script is sharp, simple, and funny. Colin Firth is Colin Firth, which is to say charming and British and handsome and lovable. Angela Lansbury did what was she was told, but I found her character a little over the top, even for a colorful comedy. The set design was neat and fitting for the tone of the film — bright vibrant colors — but since I noticed it and found it very Un-Victorian, I wonder if such a bold design is a good thing or a bad thing. It’s a wonderful film, one we’ll likely buy and watch again and show to Luke and Jake once they’re older. I can’t recommend it enough. Magical and sweet and touching and full to the brim of Emma Thompson, one ingredient Lauren and I can’t get enough of.